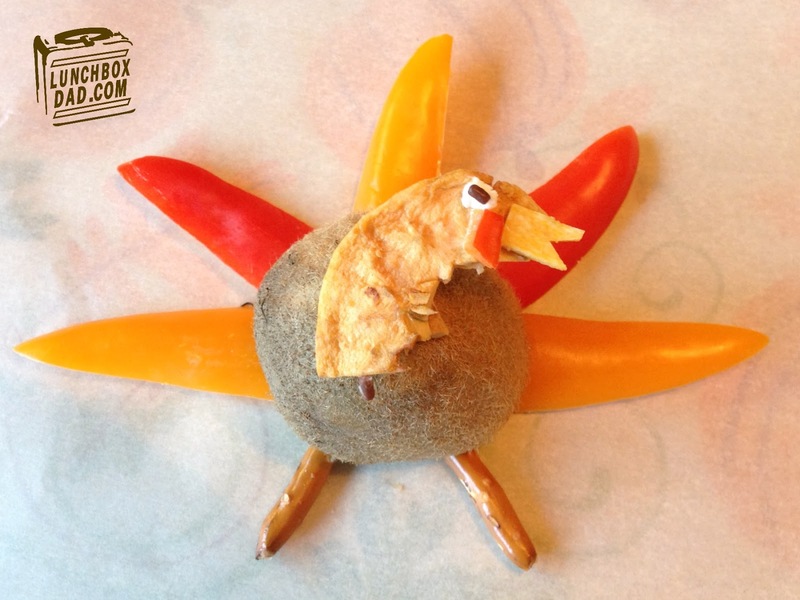 Instead of a lunch I made some special Thanksgiving themed snacks this week. I thought my kids would enjoy something fun and different. We all need ideas for the holidays and this one was so easy to make. The ingredients are pretty healthy so you don't need to worry about feeding your kids a ton of sugar. The other great thing about this is it can also include some different ingredients if your kids prefer. I have some other great recipes coming up in the next two weeks so be sure and check back regularly. --1 red and 1 yellow sweet pepper. Alternately you could use a Babybel cheese and cheddar cheese. --1 chocolate sprinkle for the eye. You could also use one of those small candy eyes if you prefer. 1. Slice of end of each sweet pepper. Slice peppers in half long ways. Arrange in fan pattern as shown in picture. Alternate colors. If using Babybel and cheddar cheese slices arrange them the same way. 2. Break pretzel stick in half and use it as the feet for the turkey. Place kiwi half on top of peppers and pretzel. 3. Cut apple circle in half and trip to fit on top of kiwi. Cut mango piece into beak shape and cut a small square piece of the red pepper or babybel wax. 4. Use a toothpick and put a dab of cream cheese on the mango and pepper and secure them to the apple. The cream cheese will act as a paste, and taste good! 5. Use another dab of cream cheese for the eye. Put sprinkle on top of the cream cheese to finish the eye. If using a candy eye paste it to the apple the same way you did the mango and pepper. 6. Break a piece of the toothpick and poke it into the kiwi in the middle. 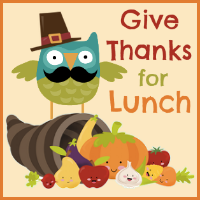 Attach turkey head to kiwi by pressing the apple onto the other side of the toothpick. 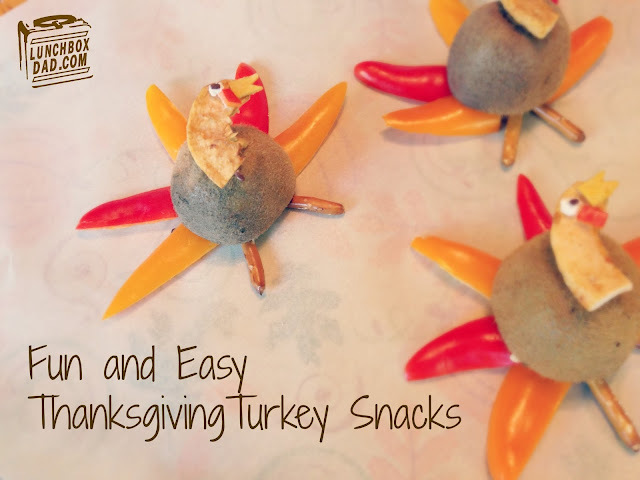 Turkey is finished and you have a great snack! The kiwi can easily be eaten using a spoon. This snack is part of a Thanksgiving linkup. Check it out to get tons of great Thanksgiving food ideas! These are so much fun, bet they were tasty too!